Everyone back together for a Beach Boys Q&A for Sirius XM? The Smiley Smile Message Board | Smiley Smile Stuff | General On Topic Discussions | Everyone back together for a Beach Boys Q&A for Sirius XM? 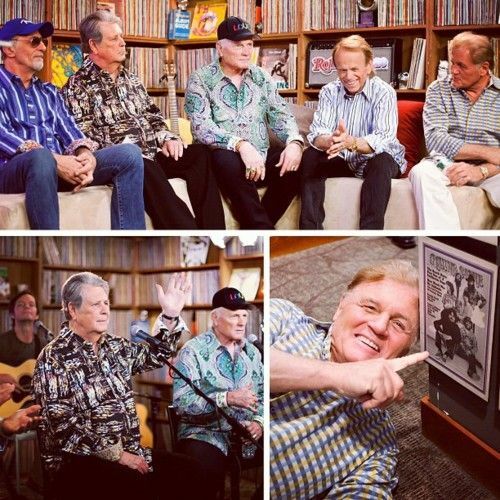 SiriusXM on Tuesday announced founding members Brian Wilson, Mike Love, Al Jardine and David Marks along with fellow Beach Boy, Bruce Johnston, will participate in the satellite radio service’s “Town Hall” series. Award-winning actor and director Rob Reiner will moderate the discussion as the Beach Boys answer questions from a group of SiriusXM listeners at the Capitol Records Tower in Los Angeles on July 30. It’s where they recorded some of their early songs. Beach Boys’ manager Jerry Schilling says it’s historic because they have not been in the same place since their 50th anniversary shows in 2012. The event will air on Aug. 10 on SiriusXM’s Beach Boys channel. Re: Everyone back together for a Beach Boys Q&A for Sirius XM? Someone ask if they will do an impromptu "Their hearts were full of spring" or "Surfer girl". It may be the last chance that the actual Beach Boys could sing together. Assuming they do actually all end up doing it in the same room at the same time, this will indeed be the first time Brian and Mike (and Brian and Bruce) have been in the same room (that we know about) since September 2012. It's quite possibly also the first time Al has been in the same room with Mike (and Bruce) since the early 2014 Ella function. I'd like to think this might get them towards working together again, but I doubt it. Schilling has a better shot at it than most. But remember that when they did their first full group function in eons together in 2006 (that time on *top* of the Capitol building), it was another 5-6 years until they actually got back together. I highly doubt they'll perform together at this event; for a variety of reasons. I'm also not holding out much hope of great questions considering SiriusXM's vetting process for "Fan Request Line" bits that they've aired so far. I'm guessing this event will be mostly (much like the 2006 event) about the novelty of seeing them all together again. My guess is this wouldn't be happening had they not re-hired Jerry Schilling. I'm hearing they might be doing some type of acoustic mini-set like the Grammy museum thing in 2012. But with almost a week to go anything can happen... or not happen. The short snippets we've seen of that performance definitely makes me want a release of the whole show. And the Rolling Stone accoustic set as well. They sounded so great! I put a sticky on this one so it's at the top of the page. Big news indeed! I didn't know Rob Reiner was a fan on the level where he'd moderate a Q&A like this. If Sirius puts out a press release that this is happening, and the AP for one picks up the feed and runs with it, I'd say there are no doubts it's on. If they sing together again, I think I will lose my mind. Even if things go back to Mike/Bruce and Brian/Al shows after this, seeing the guys sing together at least one last time will make me so happy. There's just something so special about having the original members sing together that's so perfect. After C50, I thought the chance of the group doing ANYTHING together was astronomically slim. This is a huge shocker to me. There's just something so special about having the original members sing together that's so perfect. Never thought I'd see the day. I never lose hope (however remote it may be) that there can be some healing and peace, or at least something of a truce. I cannot imagine they won't sing a note. That seems way too farfetched. My friend just told me that Billy Joel did one of these shows, and he did indeed sing (and there were other artists present other than Joel who performed Joel's songs there too). How does one obtain tickets for this? Hopefully there will be some type of video uploaded to youtube, either professionally filmed, or fan filmed. Rolling Stone has picked it up and mentions this. ...so it could tie in with a Glastonbury/ RPO deal. My prediction is Mike and Brian will be exactly the same as they were in interviews together back in 2012. The Glastonbury rumors were started by a British tabloid writer speculating about who might play there next year and then asked Mike if he was interested. I've heard that if one signs out of their account and signs up with a new e-mail address, they can get another 30-day trial, at least on the smartphone app. The annoying thing about the SiriusXM app is that, in my experience, when the free trial ends, they simply log you out of the account and when you try to log in, it simply doesn't work. It doesn't provide any pop-up notice saying "your free trial is over." So you kind of just have to count out the 30 days, and then randomly soon after the app will stop working. Thanks to Jerry Schilling, exposure for the band has increased dramatically. Eliot Lott seemed like nothing more than a caretaker. In addition to the guys performing at this event, what I'd really like to see is another new reunited Beach Boys album - followed by one or more reunited BBs special appearances, or better yet, a full blown tour. Interesting; that seems to be the most likely scenario if they chose to sing together. My thinking was that they'd want to save their new "first" reunion musical appearance for something else, something bigger. But if nothing bigger is coming, then maybe they don't view a quickie mini-set as a huge deal. It looks like both camps are shoehorning this into ongoing tour schedules (especially Mike), so there wouldn't be much rehearsal time. I'd be curious to know if any ancillary members will be there. I'd be happy with Totten and Matt Jardine (or just Matt if Al and Dave can handle sufficient guitar duties). As Emdeeh mentioned, the Glastonbury thing was just a case of one paper garbling an interview with Mike and conflating Mike's band with *THE* band in full. While truly "anything is possible", Mike already has gigs booked into the middle of 2019. I can't imagine any full reunion tour happening before 2020 unless they want to buy off and/or convert a BUNCH of 2019 Mike dates to reunion dates. All of which is getting WAY too far ahead of what's going on, I realize. But I'm not sure of the logistical/marketing issues involved in actually doing a full-blown reunion show only as a one-off. Mike's band *constantly* touring under the same name creates a constant potential for confusion in the marketplace. But I dunno, maybe a few one-off "reunion" things is how they'd have to test the waters these days. I know SiriusXM archives "events" that can be replayed. I sure hope someone is able to grab this and throw it up on YouTube. I also hope they have some video cameras there to catch this, especially if they play/sing together. Powered by SMF 1.1.21 | SMF © 2015, Simple Machines Page created in 0.187 seconds with 21 queries.